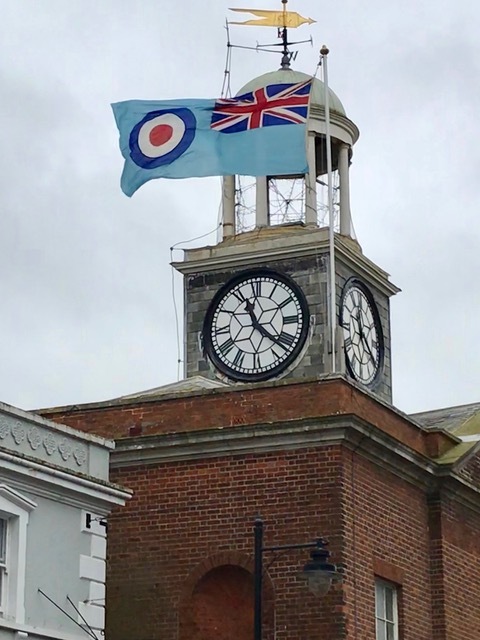 The Royal Air Force Ensign flew over the Bridport Town Hall last Easter weekend as members of Bridport and Lyme Regis Royal Air Force Association (RAFA) helped celebrate the RAF centenary after its formation on 1st of April 1918. Several events were organised and sponsorship was kindly given by Amsafe of Bridport who are a world leader in aerospace and defence safety and cargo net restraint systems. The first event took place at the Tiger Inn Bridport on the evening of Good Friday where the landlord Graham Taylor and his wife Jacqui served RAF 100 real ales brewed in their Stripey Cat brewery including Sopwith Camel and other famous WW1 aircraft names. The first pint was pulled by the Bridport Town Mayor Councillor Anne Rickard, ably assisted by Bridport RAFA chairman Alan Kidson. The landlord kindly donated all proceeds from the RAF 100 real ale to RAFA charity funds. Following a very successful Friday pub night the weather was cool but dry for the Saturday morning RAFA events held in Bucky Doo Square Bridport. Supported by the local Wessex Military Band led by their bandmaster Mr Philip Bond, the band played a variety of well known air force tunes including the ‘RAF March’, ‘The Luftwaffe March”, ‘Those Magnificent Men in Their Flying Machines’, and the RAF slow march ‘Scipio”. Also in attendance were members of the South West RAFA recruiting team including Mr Jonathan Tomlin with local members selling souvenirs of the occasion. New recruits for the RAF were catered for with a recruiting stand from the local Exeter RAF Careers Office manned by Sergeant Dave Frewin RAF and Corporal Rob Lee RAF. Members of the public were invited to donate to RAFA charity funds with collecting boxes provided by senior boys and girls of 2182 Squadron, Dorchester, Air Training Corps supervised by their Commanding Officer, Flight Lieutenant Ian Bishop RAF VR(T). Chesil Model Flying Club had a display of several historic flying models including a Tiger Moth and other RAF biplanes. On Easter Sunday there was a ‘Moment of Reflection’ at the St Mary’s Church war memorial as the Reverend Janis Moore conducted a short outdoor Act of Remembrance in honour of all past and present members of the Royal Air Force. Members of the Royal Navy, RAF and Royal British Legion military charities were present with their standards. The ‘Last Post’ was played and wreaths were laid. The final event of the RAFA Easter weekend was an exhibition in the Bridport Town Hall on Easter Monday. Several hundred members of the public attended and were able to access displays of 100 years of RAF artefacts including, model aircraft, uniforms and an exhibition of Dorset airmen and airwomen who had served with the RAF since its formation. Local family names included, Munden, Loud, Budden, Davies and Rhodes-Moorhouse who was the first airman to receive a Victoria Cross and is buried in the grounds of Parnham House, Beaminster. Again the RAFA collection was ably organised by Dorchester 2182 Squadron, Air Training Corps. Local children from St Mary’s school received prizes for their ‘RAF 100” paintings from the Bridport Mayor Councillor Anne Rickard who was also in attendance. Also on display was a magnificent iced fruit cake with the RAF crest. The final event will be Sunday 8th April 2018 at 3PM when there will be a ‘Royal Air Force 100, Service of Commemoration” at St Mary’s Church Bridport. In summary a fitting recognition of 100 years of service by the Royal Air Force with several hundred pounds donated by generous local people for RAFA charities. If you are interested in becoming a member of RAFA please contact Alan Kidson Tel: 07768 861078.